Earlier this summer, most Americans attended parades, family picnics, community fireworks and other celebratory events during a day off from work that officially observed the 242nd anniversary of the Declaration of Independence. That Declaration, and the Constitution that was developed a dozen years later, set forth the basic rights of Americans and the framework of our government. To secure the rights promised, the authors affirmed that “governments derive their just powers from the consent of the governed.” However, granting or withholding that consent requires us to form a consensus among a majority of citizens on the selection of our public officers and representatives, how we hold our government accountable, and how best to resolve the many complicated issues facing today’s society in a starkly divided America. As practitioners and scholars who comprise the American Society for Public Administration, we have a quintessential role in helping to preserve the American Republic. We must teach and practice civic education and engagement so that both the governed, and perhaps even the governors, have more than a casual acquaintance with the workings of our democracy and the aspirations of the American people. 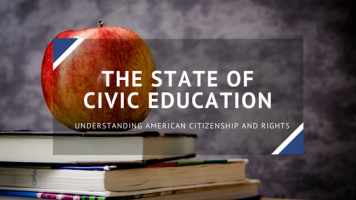 Report: A Portrait of Civic Education in the U.S.
Civic knowledge: an understanding of government structure, processes, and relevant knowledge and concepts. Civic skills: abilities that enable students to participate in a democracy as responsible citizens. Civic dispositions: attitudes such as a sense of civic duty and concern for the welfare of others. A third important aspect of the Brown Center Report is an analysis of the social studies teacher workforce — those on the front lines of any effort to improve civic learning and engagement. Unfortunately, there are no federal accountability standards for the teaching of civics or social studies. The Brown Center analysis of the social studies teacher workforce reveals that social studies teachers are significantly more likely to shoulder more responsibilities in unrelated and in addition to social studies leaving less time to focus on teaching civic engagement outside the classroom. Without this level of attention to providing civics teachers with strong subject matter preparation and focused on civic education and engagement as their primary role, it becomes difficult to imagine civics teachers providing a lasting impact on young lives that will lead to their active role as citizens of our great country. An especially noteworthy conclusion of the report is that “strengthening the social studies teaching workforce is particularly important at a time when many Americans are wondering about their country’s civic and political well-being – and are wondering about what schools could do to help.” ASPA members—both academic and practitioners—have a vested interest in a well-informed and engaged citizenry need to consider what our profession can do to “keep our republic” as well.